dovegreyreader requires no introduction to book blog visitors. The map on her site shows visitors from 181 countries; the number of hits her blog gets every day puts the rest of us to shame. While books of all kinds are her main stock in trade (and she is an avid supporter of Canadian works), knitting, quilting and exploring Devon, Cornwall and even occasionally London are often featured. Our tastes don’t always overlap but I am certainly a regular visitor to “dovegreyreader scribbles” — and will admit that those visits in the last year have brought me more information about things like knitting and quilting than I have ever possessed before. It is the walks and hikes — and the accompanying pictures of the Tamar Valley, Devon and Cornwall — that inspired this particular post however. 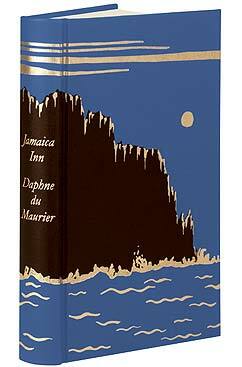 I have never read Daphne du Maurier and when the Folio Society recently produced a set of four of her Cornish novels, I quickly purchased them. They are shelved in direct view from my reading chair and every time DGR ventures around the west of England I look up and remind myself that it is time to begin the du Maurier read (here is a link to a series of DGR’s posts on the 2008 du Maurier festival). I finally got the project started with Jamaica Inn — Rebecca, Frenchman’s Creek and My Cousin Rachel will follow eventually. The woman came down the steps and peered into the coach. He was a great husk of a man, nearly seven feet high, with a creased black brow and a skin the colour of a gypsy. His thick dark hair fell over his eyes in a fringe and hung about his ears. He looked as if he had the strength of a horse, with immense, powerful shoulders, long arms that reached almost to his knees, and large fists like hams. His frame was so big that in a sense his head was dwarfed, and sunk between his shoulders, giving that half-stooping impression of a giant gorilla, with his black eyebrows and his mat of hair. But for all his long limbs and mighty frame there was nothing of the ape about his features, for his nose was hooked, curving to a mouth that might have been perfect once but was now sunken and fallen, and there was still something fine about his great dark eyes, in spite of the lines and pouches and the red blood-flecks. That introduction to her uncle is bad enough for Mary, but the appearance of Aunt Patience is even worse. Mary remembers an outgoing, cheerful woman from when she knew her aunt as a child — what she finds at Jamaica Inn is a cowering, timid creature dominated by fear. Mary knows on her first night that she must escape Jamaica Inn but she feels bound by her pledge to her mother. She will not leave unless she can take her aunt with her. It does not take long to discover that Uncle Joss is running a quite sophisticated smuggling ring from the Jamaica Inn (with more than 100 participants we eventually learn). They lure cargo ships to the rugged Cornish coast where they wreck — the ring scavenges the goods (and kills off any surviving sailors) and then distributes them from the inn. While Joss seems to be the leader, the possibility exists that he too might be taking orders from someone higher up. He responds to crises with extended benders, when his tongue tends to loosen. Be forewarned that Jamaica Inn is a melodrama — Raleigh Trevelyan says in his introduction to the volume I read that “Daphne also once hinted to me that when writing Jamaica Inn she had been influenced by Hardy.” I certainly found Hardy influences and didn’t mind them at all — but you have to grant the author a fair bit of licence to allow the book to proceed. Mary falls in love with Joss’s younger brother, Jem, almost at first blush. Given that he’s a horse thief who comes from a family of criminals, that is a bit of stretch, but it is necessary for the book to move along. I have always found it worth my while to allow Jane Austen and the Brontes some unlikely plot developments and found no reason to deny du Maurier the same forebearance. She needs it to develop all of her characters, the naive Mary in particular. More important, however, is that it creates the environment where she can describe the moor and the tors around Jamaica Inn — I quoted the description of Joss at some length; her desciptions of the landscape are even more powerful. I’ve never been to Bodmin Moor (but did visit Dartmoor once); I certainly feel that I have come to know it through this novel. All of which means I am looking forward to the remaining three Cornish novels on my shelf even more — Trevelyan’s essay indicates that they are somewhat less desolate than this one. And the next time dovegreyreader posts pictures from one of her exploration trips, I’ll appreciate those with a new sensibility. We don’t get a lot of fog in Alberta — DGR’s pictures and du Maurier’s descriptions supply an excellent counterpoint on what we are missing.